Travel the Arabian deserts to live the life one of the famed 40 thieves. Click here to play! 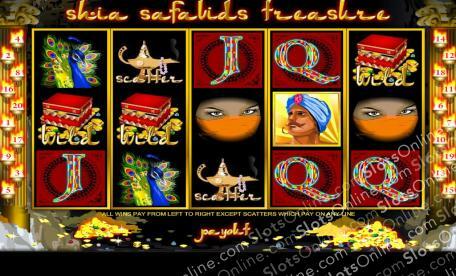 You'll encounter Arabian beauties, formidable genies and plenty of adventure in your quest for Shai Safavids Treasure. Plunder the reels of this game and bring home loads of gold, jewels and cash! As one of the 40 thieves you desire treasure the most. Be sure to spin as many treasure chests as possible because these valuable little symbols act as substitutes. They will replace most other symbols to help you bring in more winning lines. The mysterious Arabian beauty is also a sought after treasure. Spin two to five of her enchanting eyes and you'll bring in up to 2500 times your line bet. Two to five Arabian men will get you up to 1000 times your bet. Two to five extravagant peacocks will get you up to 500 times your bet, and golden slippers will get you up to 250 times your bet. A, K, Q and J's will also help you in your quest to gather as much of Shai Safavids Treasure as you possibly can. It is a rare treat indeed, which is why the genie's lamp is worth so much. Spin three to five of this scatter symbol and you could get up to 20 free spins. Thoguh any thief would be more than happy to stumble upon a pot bursting with golden treasure. Spin three of these on the board and you'll trigger the bonus game that could result in innumerable rewards. Join in on this Arabian adventure to live the life of a famed thief for a chance to win Shia Safavids Treasure! The golden lamp of the genie acts as a scatter symbol. Spin three or more of these on the board and get 5, 10 or 20 spins respectively. Three or more pots full of treasure activates the bonus feature. During this feature, the entire board will be replaced with treasure filled pots. You must choose from them to reveal how much they are worth. You get three picks, which will be added up and rewarded to you as your bonus prize.